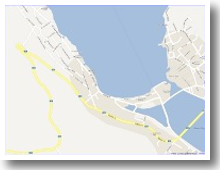 Welcome to our Web site where we offer accommodation in apartments at sea-side on Island of Pag (Croatia). 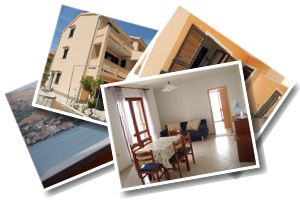 In newer part of town of Pag (Vodice) we offer you several apartments in Villa Marija. The Villa is situated in peaceful location only 60 metres from the beach. From each of the apartments you can enjoy a beautiful view of Gulf of Pag, the Velebit mountain range and the centre of the town of Pag. Vacation house Villa Marija offers accommodation in several apartments with balconies or atriums on the sea side. In front and at the back of the Villa there are two big parking-lots for the guests. In the courtyard in front of the Villa you can enjoy grill picnics. Close to Villa there are small convinient shops. Larger shops and a shopping mall you can find in the centre of the town. You can reach the town centre by bicycle or on foot and explore its sights. The island of Pag is one of the biggest Adriatic islands with its 270 km of sand and stone shore full of capes and gulfs in northern Dalmatia. The biggest among the gulfs is the Gulf of Pag with its 20 km long shore. There are several wild beaches not far away from Vodice. Town beach is very popular among families with small children. You can reach it on foot (approx. 15 minutes of slow walk) or by car (there is a free parking-lot near the beach). In close surrounding of the Villa you can choose from variety of beaches wich are all linked with foot paths. Very popular are also Zrče, Novalja, Sveti Duh and other beaches. Island of Pag is famous for its architectural and historical sights from 15th century. Especially famous is the lace of Pag wich is produced by island women on the town streets. The island is also famous for the salt production the old fashion way (the mud pools). In the area of saline (Lokunja) there's a pool of salt mud; the mud is said to have healing effects. Growing sheep is another island characteristic. The islanders produce sheep prosciutto and cheese wich are famous for their original taste. The locals also engage in fishing and wine-growing (the famous prosecco). The scarce island flora is mediterranian and very aromatical. In some parts of the island there are olive and fig plantations, and on the hills there are wildly growing wild roses, sage, lavander and some other mediterranian spices. Thanks to its location, higher temperatures and mediterranian climate the Island is a great holiday destination even off-season. Apartments Vila Marija Pag are 60m from the beach and offera nice view on the coast and the bay of Pag. We offer you five fully and beautifully furnished apartments on nice and peaceful location.